Staying grounded and taking flight. 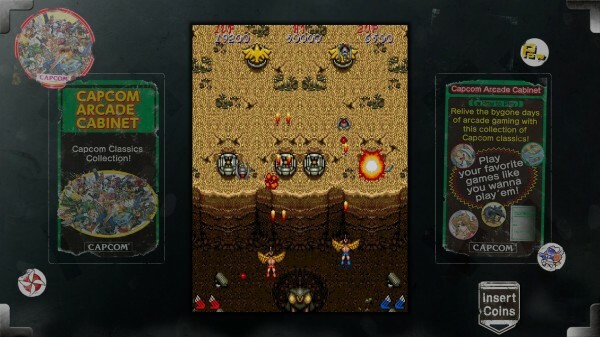 That phrase pretty much sums up what you can expect from Capcom Arcade Cabinet Pack #3, as in this little add-on – we have three more classics added to the collection. Side Arms, Legendary Wings and Trojan all came out the year before I was born, 1986. Oddly enough – this was the first time I had the privilege to try them. For those keeping up out there, you should already know that this Arcade Cabinet from Capcom has been representing gaming days of many generations ago quite well with the likes of Ghosts’n Goblins, 1943, and several other retro favorites, but are these three heavy hitting enough to warrant a purchase? Let’s find out. I have been reviewing these packs for Capcom Arcade Cabinet for a few weeks now, and the greatest joy I have had was not the nostalgia – but actually getting to play an arcade classic that had passed me up in the past. As I mentioned, I really have never gotten an opportunity to play Side Arms or Legendary Wings – and my time with Trojan was so brief that I barely have any memory of even touching the game. Thus far, I have fallen in love with a good number of these titles for Capcom’s compilation, but I feel as far as quality, Pack #3 is the weakest we have seen to date. Now, don’t take that the wrong way. These games are still solid (for the most part) or else they would not have even seen the light of day in this re-release, but Ghosts’n Goblins they are not. I will start with Side Arms: Hyper Dyne, as this title is definitely the most unique of the three. While at first it appears to be your standard, side-scrolling shooter, Side Arms actually has a lot going for it to make it feel as distinct, rather than just being a simple clone. Players start out as a character strapped in a Mobilsuit who happens to be one of two characters (Lt. Henry or Sgt. Sanders), and must take down aliens known as the Bozon. Yep, you are in space folks, and our heroes here have the power of flight. 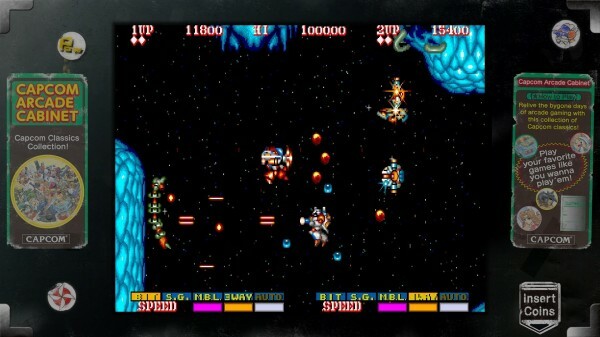 Enemies however come at the player from the ground and the skies, and the player must maneuver through the environments safely and take out every foe in their path in order to succeed. Aside from your standard D-Pad control for movement, Side Arms allows you to fire from each side by hitting one of two face buttons on the controller. Yes, it sounds simple – but being a “Bullet Hell” styled game, players will quickly learn that they have to mash like a champion while controlling their Mobilsuit in order to survive. Sound familiar at all? Well, if you have played Forgotten Worlds, it will become obvious fast as to where that famed title got it’s gimmickry from. Along with your standard shot is also a good number of power-ups such as triple-shots, lasers, and even the ability to fuse with an ally. Fusing allows the player to fire in eight directions at once and is really the ultimate technique needed to overcome all of the aliens that begin to flock around our heroes. When a human is playing with you in co-op, these abilities become shared to give both characters an even stronger advantage. Yes, can be difficult due to all of the enemies and you will die, but there isn’t a ton of punishment for death due to quarters not being involved as you simply respawn each time. Next up comes Trojan. Trojan kind of plays like a beat-em up, but if you treat it as such, you will fail miserably. 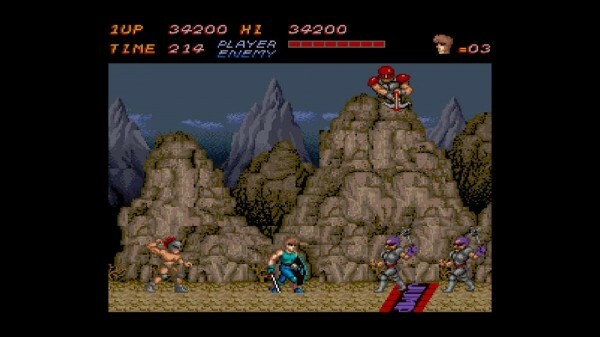 Equipped with a sword and shield from the start, the player must make their way throughout each of the six stages to fight one big boss. The gimmick behind the game however is honestly where it falters along that path. The two main control buttons have your main character attack and use the shield. The shield is needed to deflect projectiles and enemy hits, while the sword…well, it cuts things. Jumping is controlled by pressing up, which feels completely out of place as if any game needed a jump button, it’s Trojan. You see, there is always a steady stream of enemies coming from both sides. Some of these enemies hide in buildings from up above and require you to jump to hit them. A good portion of the time, I would try to hit an enemy by jumping, only to be hit by one of the enemies on the ground due to the shield not functioning well in air. Now, this does get easier over time and the save function for the game kills the pain of the lack of decent checkpoints, but I found Trojan to be more of a frustrating chore than fun. I know, it – like every game on this collection is a “classic”, but I can easily say that this style of game just isn’t for me. Finally, we get to Legendary Wings. This title starts you out in air, and frankly feels just like Galaga – but in a Greek fantasy setting. Just when you think you have the handle of the vertical shooting, Legendary Wings changes it’s entire genre and has the player go through portions of platforming. Either way however, the shooter vibe sticks throughout, as the player can upgrade their weaponry and speed to breeze through the game. I say “breeze”, but don’t go into this romp thinking it’s an easy title to conquer. Legendary Wings can have moments of great difficulty, and the player must be ready to change perspectives on each level. Yeah, we have seen this in a good number of modern titles, but Legendary Wings actually feels a bit more polished – and definitely doesn’t pull any punches when it comes to delivering a gritty, old-school challenge. Much like I said in every one of these Arcade Cabinet Pack reviews, the visuals within each of these classics are timeless. Detail pours throughout every game with pixels, and a good number will find joy in seeing that famous mascot from Side Arms as a protagonist again (as the Mobilsuit has served as a cursor in Street Fighter II and made several cameos throughout other Capcom titles) and just where his heritage comes from. 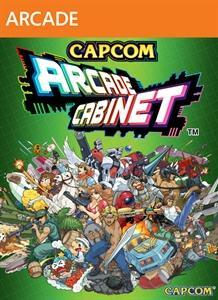 Of course all of the other additions for Capcom Arcade Cabinet, such as art galleries, themed backdrops, and those dusty stickers I love so much play a great role in bringing out the fan service as well, so if these titles do tap your own nostalgia buttons, there is plenty of new treatment to see here. Soundtrack wise, I wasn’t really too fond of Trojan’s soundtrack – even though it wasn’t terrible, but Side Arms and Legendary wings proved to be miles above and delivered some fantastic tunes that I never knew existed up until this review. Yeah, I missed out on a lot, and if you love your classic shooter sounds from the 8-bit era, you will have plenty of reason to keep those speakers on high as you take out aliens and futuristic thugs alike. It’s funny how nostalgia works. For the past two packs with this compilation, I have had titles that I grew up playing in one form or another tap into the kid inside me and make we want to finish each game until completion. Well, this time, I was in a new yet old world. Side Arms and Legendary Wings are both solid titles that have aged little due to their groundbreaking design and gimmickry alike, but Trojan just was not up to par with any of the other games in this entire collection in my eyes. Sure, I can see the appeal, but much like all of these arcade games, appreciation will come down to a matter of preference and experience. It may not be the strongest or my personal favorite pack from Capcom Arcade Cabinet, but 1986 still had it’s gem and Pack #3 is strong evidence of that. You just might want to wait for a price drop or sale however before making the plunge this time around.